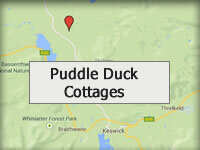 Located by a stream with ducks in the heart of Bassenthwaite Village near Keswick. Family-run business with a traditional country feel. 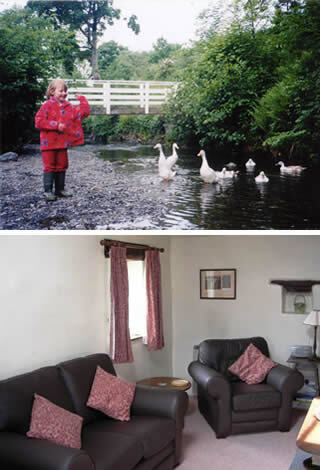 Puddle-Duck Cottages (previously known as Loft Holiday Cottages) are located by a farm and small stream which is home to our popular puddle ducks in the heart of the small Lake District village of Bassenthwaite. We are just 15 minutes drive from the popular Lake District market town of Keswick, on the shores of Derwentwater, and the historic town of Cockermouth where the poet William Wordsworth was born and which has a wealth of independent shops. Jemima’s Cottage sleeps up to 5 in 2 bedrooms and Rebecca’s Cottage sleeps up to 3 in 1 bedroom. We are a family run business which has been providing holiday accommodation for more than 40 years and have many guests who return regularly. Don’t just take our word for it – see our reviews on Tripadvisor – Jemima and Rebecca. Enjoy the benefits of booking directly with an independent, family-owned business – we are often cheaper and more flexible than many of the big holiday cottage agencies. Many guests enjoy letting the puddle ducks out of their shed in the morning (and collecting their eggs when laying approx Spring to Autumn) or sitting on the benches by the stream watching the world go by. Children often enjoy playing in the stream, the small open wood or on the swings by the cottages and on the village green – ideal for a game of football or cricket! We recommend children bring wellington boots. There are walks for all abilities straight from the cottage door or after a short drive. A series of local walk booklets is available with proceeds to cancer research. Bassenthwaite has several working farms and throughout the year animals can be seen in the fields around the village. The Sun Inn pub serving bar meals is located in the heart of the village, a couple of minutes’ stroll along the stream from the cottages. A short walk or drive away is a small shop on a caravan park selling general supplies (open daytime April to October). We are in an ideal location in the quieter northern Lake District for walking, hiking, climbing, fishing and sightseeing and for exploring all Cumbria has to offer including the historic border city of Carlisle, Solway Coast, Hadrian’s Wall, the lovely Eden Valley as well as the Lake District . Whether you are looking for a short break or week’s holiday our holiday cottages give you the flexibility to set your own pace and truly relax. We like to be as flexible as possible so please don’t hesitate to call or email for our availability and prices. If you've never been to the Northern Lakes then have a look at ourThings to do page for a few ideas.